Norman Equipment has been a leading supplier of hydraulic equipment including hydraulic valves for over 70 years. Full-line authorized stocking distributor of quality hydraulic components and systems from top manufacturers renowned for performance and reliability. Our experienced staff, in-house technical expertise, exceptional customer service and proven products provide you a single source for all your hydraulic pump needs. 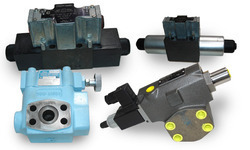 We carry a large selection of directional control, flow control and pressure control valves, proportional valves, cartridge valves plus valve accessories, parts and kits. We are authorized sales and service reps for Parker, Delta, Denison, Deltrol Fluid Products, Dynaquip, Dynamic FC, Nachi, Lexair, Rotork, Northman and Huade.